In looking for more information about the apparently awful play “Maid in the Ozarks,” I found a copy of a playbill on eBay, which contained photos of young Jack Nicholson, who played the role of Thad Calhoun. The production company was Jackie Productions, Inc., of which I know nothing. 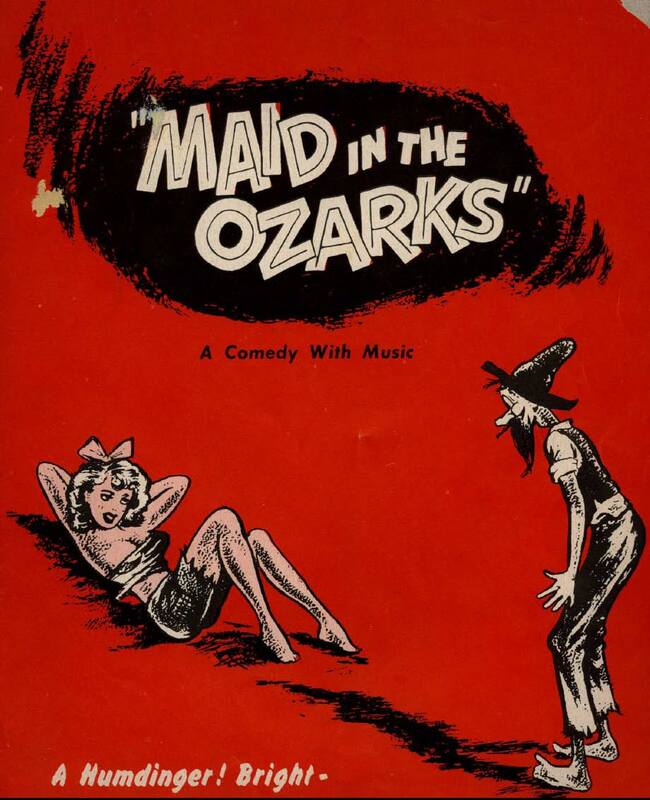 “Maid in the Ozarks” apparently was staged in Los Angeles in 1941, and Robert Mitchum was in it for a while. It was a big hit around the country, and the Chicago production eventually moved to Broadway in 1946, where the public loved it and the critics hated it. The play traveled around the country with the Broadway lead Burman Bodel. At some point in the 1950s, Jack Nicholson took a crack at it. I’ve posted a couple of photos of Jack Nicholson from the playbill here. Posted in Ozarks economy and tagged jack nicholson, maid in the ozarks, robert mitchum. Bookmark the permalink. What a delightful piece of ephemera! My grandfather was Burman Bodel, we have all sorts of playbills also there are photos (even more online now) so we might be able to give you some information. Right now I am trying to find out if anyone ever took video footage of it anywhere. Jessica, thanks for writing. Where in Missouri was Burman Bodel from? He was born in Skidmore, Nodaway, Missouri and then moved to Yuma Colorado. I’d love to see the video. This is a video clip of a section of the play Burman edited it himself I believe (he often did this kind of thing) it can be hard to follow the words he inserted as the film is actually silent, the soundtrack is actually from the Maid in the Ozarks as well, it is actually from the time when Jack Nicholson was in the play, its done by the Ozark Mountaineers. Burman actually was the one who staged and redid the play as a musical. My father combined the sound clip with the video clip.